Of all the concrete leveling techniques currently available, the PolyLevel® technique shows the most promise in terms of costs and benefits. Concrete has remarkable versatility as a building material. For residential and commercial applications, it offers outstanding strength and durability, delivering these qualities at an affordable price. Because the material can be tinted, textured and formed, it’s usually the first choice for all kinds of flatwork –everything from driveways and sidewalks to factory floors, patios, residential slabs and pool surrounds. If you suspect that something might be wrong with your concrete, leveling might be the solution. Contact a professionally trained PolyLevel® contractor to take a look. Our dealers offer free estimates for services needed! One concrete characteristic that can cause problems is the weight of the material –about 150lbs. per cubic foot. Sometimes the soil beneath a concrete element doesn’t have sufficient load-bearing capacity to support the material and the static loads imposed on the concrete. When this happens, all or part of the slab will sink. Settled or sunken concrete is usually a serious problem. Sunken sidewalks and pool surrounds pose a safety hazard. A concrete factory floor that cracks and sinks in one area can make the building unusable. The same goes for an airport runway. One solution to sunken concrete is to demolish and remove the slab or slab sections that have settled. But this necessitates building new formwork, installing proper reinforcement, pouring fresh concrete and waiting for new flatwork to harden and cure. 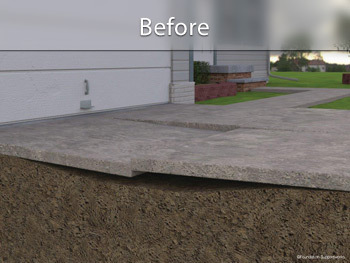 A less costly and more expedient solution involves using concrete leveling techniques to raise the sunken concrete back to its proper level. The terminology associated with concrete leveling can be confusing. Some terms (like slab jacking and slab raising) are generic. Others –like PolyLevel®—refer to specific techniques. Mud jacking is used both ways: to describe concrete leveling in general, and to describe a particular slab jacking technique. Costs less: Concrete lifting costs less than concrete replacement. Faster installation: Full weight-bearing function possible within a short time compared to replacement. Less mess: There is no need to demolish concrete and no damage to landscaping. Environmentally-friendly: Removed concrete often ends up in landfill; with concrete lifting there is no waste. 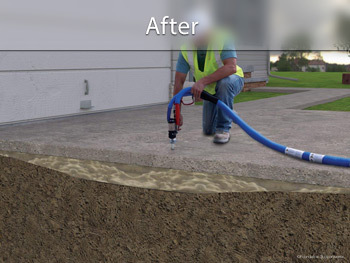 Preventative: Fills voids to prevent erosion and further damage to concrete caused by animals and insects. Also helps stabilize soil. Improves safety: Eliminate trip hazards and prevent personal injury or possible lawsuits from uneven steps or walkways. PolyLevel® is a state-of-the-art concrete leveling method that uses high-density polymer expanding foam to raise settled concrete slabs. PolyLevel® can be used for residential mudjacking and a variety of commercial applications - from raising settled roadways, highways and bridge approaches; leveling even warehouse floors, to supporting pipelines. Contact us today to find your local concrete leveling contractor and to schedule a Free Estimate for PolyLevel®!